We are proud to offer quality, local, fresh ingredients wherever possible. With cereals, fruits, yoghurts and sometimes croissants. Cornish sausage, bacon and hogs pudding, local free range egg (poached, fried or scrambled), mushrooms, vine ripened tomato, saute potato and Heinz baked beans. A Full Cornish but with vegetarian sausages or home made cheese and herb patties (if we know in advance). Sandwiches. Sausage, bacon or egg. Cornish Rarebit (posh cheese on toast). French Toast (eggy bread) with bacon and maple syrup or honey. Smoked Salmon and scrambled egg served on a toasted muffin or toast. Smoked Haddock with poached egg and vine ripened cherry tomatoes. A good old British cuppa with or without caffeine or a selection of flavoured or herbal teas. Fresh ground cafetiere coffee with or without caffeine. 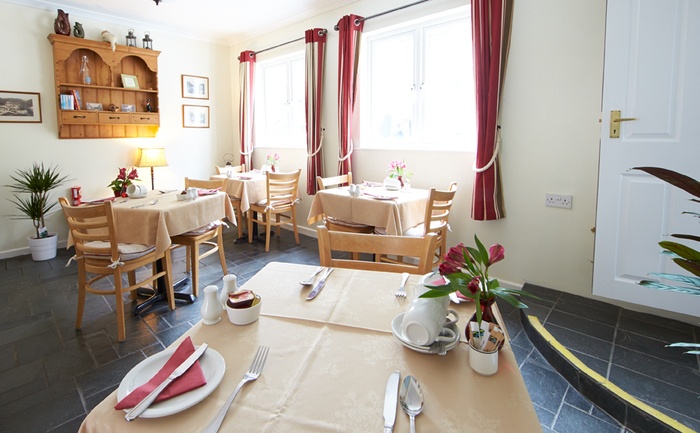 Breakfast is served in the breakfast room between 8.00am and 9.00am and cooked/prepared to order. Please let us know of any dietary requirements so that we can cater for you.